There was no doubt that Liverpool manager Jurgen Klopp was tetchy after Sunday’s goalless draw at Everton in the Merseyside derby - a sign that the pressure is mounting on him and his team ahead of Sunday’s meeting with the Clarets at Anfield. A run of four draws in six games isn’t title-winning form and if there are any signs of the three points being in danger against Burnley you can expect the mood inside Anfield to change very quickly – in the stands, on the bench and on the field. An early goal for the home team and that will all change. For all their recent disappointments away from home, the 5-0 win over Watford last week was a reminder how Klopp’s side can rip teams apart. But the pressure is there. It is 29 years since Liverpool last won the title and only five years since Brendan Rodgers’s side let the title slip from their grasp. The club’s marketing slogan is “We are Liverpool - This Means More” and whatever one thinks of the clubs suggestion that they are unique, there is no doubt winning the title, this year, with this team, matters hugely to their fans. Another meltdown would be unthinkable. I’ve covered Liverpool a lot in the past two seasons. The Kop is a great asset on big nights in Europe and when the likes of United and City come to Anfield. But the ground can go quiet very quickly on ‘lesser’ occasions, and with the current edginess of the title race, the nerves can easily spread to the field. Liverpool fans want to see a return to the adventurous attacking football that saw them reach the Champions League final last season and took them to the top of the Premier League before their recent struggles, and Klopp’s comments at Goodison Park showed he is wary of giving in to the temptation to be cavalier. Add into the mix the spat between Klopp and Sean Dyche after the 3-1 defeat to the Reds at Turf Moor in December, where the Burnley boss used the word “cheating” in relation to a Daniel Sturridge dive, and Klopp complained about Burnley’s tackling, and there is additional spice, however much the managers will play down that history. One thing we have seen throughout Burnley’s time in the Premier League is that the big clubs hate being frustrated by those below them. The play-acting starts, complaining to the referees, managers remonstrating to the fourth official. Sometimes, with a weak ref, it works. Other times that behaviour takes their focus. Dyche will surely set the team up to frustrate, to harry, to limit the service to that ultra-dangerous front three of Mohamed Salah, Sadio Mane and Roberto Firmino. 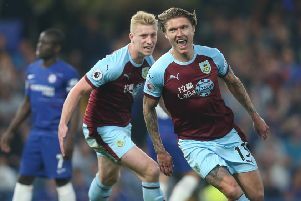 If the Clarets can do that – a huge task given the gulf between the two sides on every level – the pressure, the tension, the fear will creep in. And if the mood changes, anything could happen.